In order to see the FIAPBT Pedigree Online and pictures, you must doing clic in its corresponding name. Once within his Pedigree Online, you can realise your own genetic study in your own way. for example doing clic in the names of the parents, will be able to also visualize its FIAPBT Pedigree Online of four generations, in which if you doing clic in its pictures, will be open in greater size so that it is possible to be seen better the dogs. Following in Pedigree Online and doing clic in the names of the APBT that appear in ascending scale, you can get to find or track the parents of our American Pit Bull Terrier up to two centuries back, until the years of the 1800, a huge number of generations, more controlled than the own people. This great amount of genetic information is something unpublished, surprising and exclusive, that only own our wonderful and noble breed dog, the American Pit Bull Terrier. The most important thing in the breeding selection in Villa Liberty kennels and continuing the way of selection of this breed dog since its origin, is to reproduce American Pit Bull Terrier with an exceptional disposition in the relation with the people. In Villa Liberty Kennels, the most important factor in the breeding of the American Pit Bull Terrier is the focus on the conservation of old days’ original and most pure genetics, in order to congeal it or to conserve it intact during the major number of years that are possible to us. We also are guided by the class and chaste (by work and sport endurance), all of it within a balance of all aspects of the animal. When the moment arrives for selecting dogs for the Villa Liberty kennels reproduction (really will be those that will give continuity in which to quality about in the APBT of our kennel in the future), we chose those dpgs that show to us of several forms dominance in its genes, of the desirable characters that we want to fix to our dogs, especially the intelligence gene. This way to work, crossing the best to best under our point of view, is what it assures to us that our APBT in the future will maintain the quality that as much we like of them and this makes feel us very well with ourself. Besides the intelligence gene, we maintain in our dogs other genes or links of the genotype quite important for us, that fixing them all together constitute the chain of the elite American Pit Bull Terrier; The Brilliance or Light, intelligence, bravery, tenacity, balance, attitude-positive personality, ability, endurance, and strong grip. About the standards of our APBTs, we look for them to adjust to a functional phenotype proportionated that allows him to combine agility-power (ADBA or FIAPBT) and a good bone structure. Beauty is not something we look for in our dogs, if we did so, our dogs will lose other desirable traits for a variety of functions. 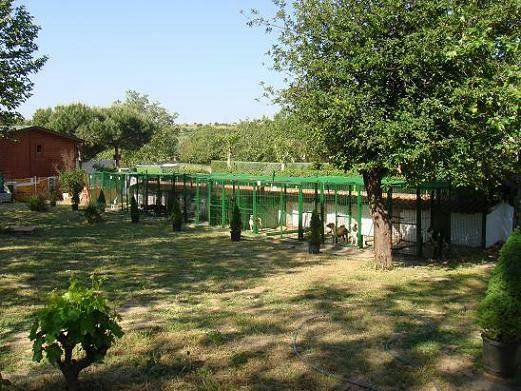 Our dogs live in kennels holding the hard climatology of the madrilenian countryside, much ice in winter and much heat in summer, humidities, airs and all type of disadvantages of this hard madrilenian climatology. In the following picture, you can appreciate Villa Liberty kennels in 2006 winter, where the American Pit Bull Terrier is almost imperceptible by the frozen time even being within the objective of the camera. Minimally it is possible to be appreciated that some of these dogs are seated so calm and happy watching the winter landscape from their kennels as if nothing had happened. The previous night from when this picture was taken, the thermometer marked 20 degrees below cero (-20º), a temperature that few dogs could hold to survive in the same conditions, nevertheless no dog of Villa Liberty kennels to take cold or constipated that winter of 2006. Circumstantial tests of the nature in the good or bad breeding genetic, where simply it comes to confirm us of another different way that we go by good way and this makes us feel very well. The studs of Villa Liberty Kennels have been those we considered the best overall, after studying them in the aspects explained before, so that we could fixed the desirable traits into their offspring, which will represent Villa Liberty kennels around the five continents. During 34 years continuous and without interruptions working around this wonderful and noble breed, the 17 generations of APBTs by means of the selection of the best, guarantees our work, thanks to the support of our “dogs of Light”. 1) Inbreeding: We use this kind of breeding after noticing the extraordinary qualities and virtues of one of our American Pit Bull Terriers that we want to preserve even if the animal is no longer alive or cannot be bred for any reason. Even if the APBT with the desirable traits is deceased for decades, using inbreeding we can maintain these genetics for a long period of time, as long as we are healthy enough to continue with the passion of the breeding of the APBT. We can also use the inbreeding to cleanse or to purify our genetics of undesirable traits. We have to take into account that using this method of breeding can also double the undesirable traits if we don´t do it correctly. We use the best studs to improve the quality of the whole Villa Liberty family more than improving just a single dog. This is more advisable and offers more guaranties. By using the inbreeding we increase the dominance of the desirable traits we want our stud dogs to pass on to their offspring. We carry out the inbreeding when the mating is done by the first generation, and it has 6 different combinations. The first three are first degree inbreeding: father and daughter, son and mother, and sister and brother. The other three are second degree inbreeding: half brother and half sister, uncle with nephew, and nephew and aunt. FIAPBT Pedigree Online: VILLA LIBERTY´S "RED PIT 3"
Online Pedigree: VILLA LIBERTY´S "RED PIT 3"
The goal of RED PIT 3, inbreeding is clearly fixed by the genetics of RED PIT DE VILLA LIBERTY . RED PIT 3 example is the culmination of a very strong and charged inbreeding, which has given very positive results in Villa Liberty Kennel. But it is important to recognize that there was a high level of risk of failure in achieving this, and we do not recommend to adventure yourself in such a closed inbreeding unless you have the necessary knowledge, means and experience. And why not, we must say you also need a good amount of luck. VIDEO “RED PIT 3”. “COWBOY 4” Is a individual one extraordinary "Midnight Cowboy" and Walling´s “BULLYSON” in its genetic majority. “COWBOY 4” is a very intelligent APBT with a wonderful combined functionality this, with an extraordinary heart, to finishing his Works - Sports by very hard that is to be realised circumstances and it is a APBT very balanced in all the aspects important to consider. “COWBOY 4” is another example of first degree inbreeding like RED PIT 3. FIAPBT Pedigree Online: VILLA LIBERTY´S "RED DIBO"
Online Pedigree: VILLA LIBERTY´S "RED DIBO"
RED DIBO parents are brothers to the same parents, and those parents are also brothers to the same parents. RED DIBO’s example is the culmination of a quite strong inbreeding that luckily is giving great results in the reproduction of this genetics. Thanks to the inbreeding, RED DIBO’s genetics has a 50% of Bullyson, 50% of Midnight Cowboy, 50% of Hand’s Candy, 50% of Hand’s Happy Jack, and 50% of Lee’s Cowgirl. Looking at these facts, in genetic terms, RED DIBO can be considered a direct son of Midnight Cowboy and Hand’s Candy, as well as Bullyson’s. RED DIBO has a 45% of Tudor´s “Dibo” ‘s genetics, almost as if he was a direct son of him. Taking into consideration he died 51 years ago (1958), this can be considered an extraordinary fact under knowledgeable dogman’s eyes. This amaizing 45 % of Tudor´s “Dibo” that RED DIBO has, is only exceeded by “Mr. Ronnie” ‘s 52,58 %. BOUDREAUX inbreeding´s goal, is clearly set by a fixation of the excellent couple BOUDREAUX' SKULL X BOUDREAUX' SCREAM, due to the fact that it has all the genetic doors of their upward braches closed to these two specimens, having a 62´5% of BOUDREAUX' SKULL and a 37´5 of BOUDREAUX' SCREAM. It is also important to mention the not insignificant 43% of BOUDREAUX' MAVERICK. ‘S genetics. “MR. 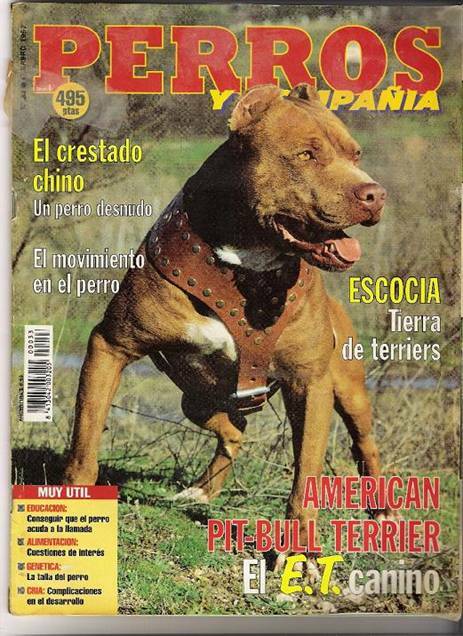 RONNIE” has in his genetics the highest existing percentage of any APBT able to breed, with a 52´58% of TUDOR'S “DIBO”, who in my opinion is the best APBT of all times. Another example of second degree inbreeding is found in “TOP SECRET”´s genetics, where his parents are half brothers on their father’s side. “TOP SECRET” has a quite considerable percentage of CARVER'S STOMPANATO, with a beautiful touch of CARVER´S BOOMERANG (Davis), which makes him a very adequate stud for the conservation of Maurice Carver dogs’ genetics in Villa Liberty Kennels. The inbreeding highlights the good qualities as well as the bad ones. It is a double edged knife, but it is the best tool a breeder can use to cleanse or to purify his dogs’ blood, of the undesirable traits, and at the same time, can fix the desirable ones. Inbreeding, in general terms, means a more dominant breeding and more capable of transmitting the genetics to the offspring than outcrossing. Because of the later, when a serious breeder carries out his first inbreeding, it is fundamental to keep the whole litter until they have grown to their first year of age. All this, in order to make sure that the results are the expected ones, and that no health or character problems are present. Not doing so, will pass these problems to the future owners, and that wouldn’t be fair to them nor to the dogs. Evenly, any responsible breeder should do this at any time he experiments an unknown phase of inbreeding. We do not recommend doing this kind of breeding unless the proper knowledge, experience and means are met. This is necessary to guarantee a minimum of success in achieving the expected in what physical and psychological health is concerned. We neither recommend doing this breeding without having almost perfect genotypic and phenotypic APBTs. 2) Outcross: We utilize this breeding when the inbreeding in our dogs is to saturated or closed, and so there are a few chances to continue in this direction. With the outcross breeding we clean up and oxygenate a saturated blood by opening it up, so that later on we can close it down again. This way we can preserve our APBT family for years not only without damaging it, but actually we can substantially improve it. This is a well kept secret that old dog men have used to preserve their genetics, and we at Villa Liberty, are pleased share it with those who enjoy this marvelous and noble canine breed. RED PIT comes from very good opened genetic combination that combines Midnight Cowboy with Hand’s Candy, Pat Patrick’s dogs, Cooper and Orday. It also brings the best British APBTs by the mother’s side which are represented by its double great grandfather WELLER´S EVIL JIM . The opened blood and the great quality that RED PIT ‘s blood has, made him a magnificent stud. This great variety of genetics was the key to perfectly combine it with other closed genetics, and as a result, he gave very good quality litters. LAST VIDEO OF “RED PIT” with almost 15 years old. Another example of Outcross breeding we have it in CH PATCHES, whose parents belong to different families. CH PATCHES, is the result of a fusion in the genetics of CARVER and that of RED PIT, which offered us great results in working sports. CH PATCHES has quite dominant genetics, through which, he transmits to his offspring an extreme intelligence and a great vitality and energy, the later being a characteristic of dogs coming from outcross breeding.